With major research in the study of Neurofibromatosis type 1, Peggy Wallace’s work relies heavily on patient contributions. NF1 is a dominant nerve tumor syndrome affecting 1 in 3,000 that can be difficult to diagnose, especially in children. It has no effective treatments for the major complications, which can cause disability or death. Part of her research involves becoming close with many families affected by NF1. “One patient who has provided inspiration keeps in touch and has donated over 30 tumors to research,” Wallace says. Wallace is one of the pioneers in NF1 research and has active collaborations with research labs throughout the United States and in Europe. Much of her research with collaborator David Muir involves growing patient tumor cells in culture for experiments to better define treatment for NF1. 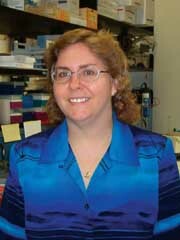 Currently, Wallace’s NF1 work involves examining whether steroid hormones affect cells involved in NF1 tumors. Other NF1 research involves characterizing gene mutations in NF1 tumors to better understand the genetic changes in tumor cells. “This also leads to better understanding of why tumors develop, to help design rational therapies that stop tumor formation.” Wallace says. Wallace also has pilot projects and collaborations in other areas related to understanding the genetic basis of medical conditions.